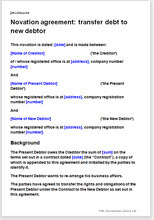 Use this novation agreement to transfer a debt obligation from one party to another (i.e. change who will repay the debt). Common uses are when a business is sold and the purchaser takes on the liabilities of the seller, or when restructuring debt (a third party buys the obligation to repay a loan and interest). A common misconception is that a novation of a debt is a cancellation of old debt in exchange for issuance of new. Instead, novation just changes the parties to the original contract and doesn’t create a new contract. In most cases, novation is an easier option than cancelling and drawing new agreements. This is a simple yet comprehensive agreement that can be used to novate any debt, usually with only minimal editing. This document can be used to transfer any loan or debt to an individual or company provided that the creditor agrees to the transfer. You should use this novation agreement, rather than an assignment agreement if all parties to the contract will agree to the change and sign the contract. Its usually easier just to get the transferring parties to sign an assignment agreement, but some contracts have non-assignment clauses that mean that novation is the only valid way of transferring the contract to someone else. If in doubt, use this agreement and obtain consent from all involved. If you want to transfer the debt to another creditor (i.e. change who will receive the repayments), then use of the Novation agreement: transfer debt to new creditor agreement will be more suitable.